My name is Gustavo Ciríaco. I am a Brazilian artist from Rio de Janeiro, working internationally in Europe, Latin America, Middle East and more recently in the Far East. My education started with Political Sciences and Anthropology, before being more and more attracted to dance, stage craft and the visual arts. As an artist, I have been working transversally between performing and visual arts, visiting other fields, other voices. I’ve been using choreography, theatre, video, story telling and urban actions in conversational pieces where the dimensions of the meeting are the inspirations for shared fictions and situations. Many a time, this is done through focusing on people and their contexts, in search for ways of manipulating the daily life sublimes, gathering potentials, tools and insights in how to deal with time and space. I have been using different formats, delving into exhibition and presentation structures in conversational pieces. There are many tiny things, iridescent sensations, feelings that set us adrift and move, things that rearrange our eyes and memories, our very presence in the biographies we bear. I do enjoy what is material in things, the flavour of each situation, its poetry in derivation. (Rio de Janeiro, 1969) is a Brazilian performing and contextual artist. He started his career in Political Sciences and then drifted to dance-making and convivial works. Ciríaco works internationally in Europe, Asia, Latin America and the Middle East on projects, artistic collaborations and workshops. In his projects he dialogues with the historical, material and affective context one is immersed within in any given situation. In terms of art forms, Ciriaco’s work moves from multimedia staged conceptual work, through to urban walks and convivial open-air projects. His works tend to involve the spectator in a shared production of both present and presence. He has been present in major national and international festivals, galleries and venues (San Art Gallery/Saigon; Tanz im August/Berlin; Paris Quartier d’Été, Galerie Michel Journiac/Paris; Battersea Arts Centre/London; Taipei Digital Art Center/Taipei; Prague International Festival; Casa Encendida/Madrid; Bienal de Danza del Caribe/Havana; Alkantara and Culturgest/Lisbon; CENEART/Mexico City; Panorama/Rio; Metropolis/Copenhagen; Constelaciones, Buenos Aires; Serralves Museum, Porto, among others). He has been artist-in-residence at PAR-Programa Artistas en Residencia (Montevideo); Les Récollets (Paris), Casa Encendida (Madrid), Alkantara and ZDB Galeria (Lisbon); BCS (Taipei), Al Mamal Foundation (Jerusalem) and Tokyo Wonder Site (Tokyo). He was the artistic director of Manifesta! (Rio) and guest curator for the festival ENTRE Lugares (Rio | London) with Chelsea Theatre. In 2012, he was part of Rio Occupation London, the Brazilian Artistic Mission under London Cultural Olympiad with the project where the horizon moves at V22, in partnership with Battersea Arts Centre. He’s been acting in urban space projects and landscape projects: Where the horizon moves (Guimarães Capital Européia da Cultura and London Cultural Olympiad); Here whilst we walk (premiered at Alkantara festival, Lisbon 2006 and seen in over 30 cities) and Neighbors (Casa Encendida, Madrid 2009), in collaboration with Andrea Sonnberger (Aus); in museum projects: In the middle of what we see (Veículo de Intimidade | Hoje, Museu Coleção Berardo, Lisbon, 2016); A room of wonder (Tokyo Wonder Site/Tokyo and Largo das Artes/Rio); in conversational pieces: Drifting (Rio, Taipei, São Paulo, Lisbon and Porto) in partnership with António Pedro Lopes (Pt); and in dance projects: Gentleness of a giant (Negócio / Galeria ZDB, Lisbon, 2016); Those who walk on the ground, who climb trees, who bear wings (Galpão das Artes/Rio de Janeiro Botanical Garden, 2014); Eles vão ver (They shall see) (Panorama, Rio de Janeiro, 2010); Nada. Vamos Ver (Nothing. We shall see) (SESC São Paulo and Culturgest, Lisbon, 2009); Still – sob o estado das coisas (SESC São Paulo, 2007), among others. As a lecturer, he has held talks at San Art Gallery (Vietnam) Tokyo Fine Arts University (Jp), V&A Museum, Chelsea Theatre (Uk), Ramallah Fine Arts University (Palestine), Opéra de Lyon (Fr), Fnac Lisbon (Pt), Museo Reina Sofia, Casa Encendida (Spain), Taipei Digital Arts Center (Tw), Itau Cultural, Centro Cultural Banco do Brasil, Panorama Festival (Br), Teatro Solis, (Uruguay), Bilbao University (Sp), among others. Since 2009, Ciríaco collaborates with Fernanda Eugénio in site-specific projects and workshops in Portugal, Brazil, Vietnam and more recently in the USA. In 2015, they started the project Steaming Cities in New York, hosted by the Hemispheric Institute for Performance and Politics/New York University (April 2015). Veículo de Intimidade | Hoje, Museu Coleção Berardo, Lisbon. Largo das Artes, Rio de Janeiro, May 2013. Capacete, Rio de Janeiro, Brazil. Centro de Artes Visuais de Coimbra, Portugal. Installation work in collaboration with Marcela Levi and Flavia Meireles. Premiered at: Solos de Dança do SESC, March 2009. Rio de Janeiro, Brazil. Mostra Brasil Dos Cares, Mercat de Flors. Residency and presentations. Barcelona, Spain. March 2015. Circuito SESC de Artes, in Bebedouro, Itápolis, Novo Horizonte, Eldorado, Iguape, Registro, Tietê, Santos, Capivari and Limeira, in São Paulo State, Brazil. April-May 2014. Festival Panorama, Rio de Janeiro, Brazil. October 2013. V22 & London Cultural Olympiad 2012, London, UK. July 2012. Maus Hábitos & Guimarães European Cultural Capital 2012, Guimarães, Portugal. June 2012. Walk&Talk Urban Art Festival, Ponta Delgada, Portugal, June 2013. Modos de Existir, SESC Santo Amaro, São Paulo, Brazil, April 2013. ZDB, Lisbon, Portugal. January 2012. DESABA and Semanas de Dança – Centro Cultural São Paulo, São Paulo, Brazil, April-May 2011. Bamboo Arts Studio, Taipei, Taiwan, July 2010. Casa França Brasil, Rio de Janeiro, Brazil. May 2010. Première at Festival En Tránsito, La Casa Encendida, October 2009. Madrid, Spain. Jerusalem Show, Jerusalem, Israel. October, 2011. Alkantara. August 2009, Lisbon, Portugal. Casa Encendida, October 2008. Madrid, Spain. Aula de Danza/ Universidad Alcallá de Henares, October 2008. Alcallá de Henares, Spain. Premiered at: Alkantara Festival, June 2006. Lisbon, Portugal. San Art Gallery Lab. Saigon, Vietnam. (excerpt). January 2015. Walk & Talk Public Art Festival, Ponta Delgada, Azorean Islands, Portugal. August 2014. 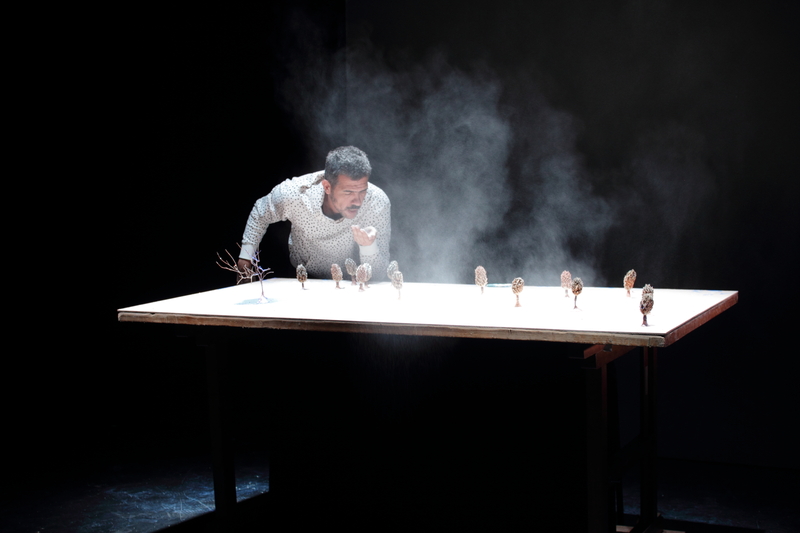 Theatre in Ordinary Life Spaces – discussions and demonstrations, Digital Art Center, Taipei, Taiwan. December 2012. Festival du Tourisme Aléatoire, Ferme du Buisson, Paris, France. June 2012. Chelsea Theatre, London, UK. July 2011. Serralves em Festa, Porto, Portugal. May 2011. Intimate Strangers, Ghent, Belgium. April 2011. Festival Verão Azul, Lagos, Portugal. February, 2011. Bienal de Dança de Fortaleza, Fortaleza, Brazil.October 2010. Festival de Dança Contemporanea, São Paulo, Brazil. November 2010. Movements in urban space, Leipzig, Germany. June 2010. Prague International Theatre Festival, Prague, Czech Republic. Oct. 2009. Centre National Chorégraphique de Tours, Tours, France. Sept. 2009. Metropolis, Kobenhavn Internasjonal Teater, Copenhagen, Denmark. August 2009. Der Flaneur – The congress, Schausspiel Frankfurt. Frankfurt, Germany. June 2009. En marche, Galerie Michel Journiac, Paris, France. April 2009. Tanz im August, Berlin, Germany. August 2008. Festival Ex-centrique, Chinon, France. May 2008. Contact Theatre, Manchester, UK. May 2008. Sacred festival, at Chelsea Theatre, London, UK. May 2008. Festival Paris Quartier d’Été, Paris, France. July 2007. Festival Les 7 Collines, St. Étienne, France, July 2007. Liverpool Live 06, at Bluecoat Art Centre, Liverpool, UK. October 2006. Here whilst we walk / here whilst we talk – performance and lectures, at Der Farberei, Munich, Germany. September 2006. In-presentable, at Casa Encendida, Madrid, Spain. June 2006. Nottdance festival, Nottingham, Uk. April/ May 2006. Arnolfini, Bristol, Uk. May 2006. Junction theatre, Cambridge, Uk.. May 2006. Laban Centre, London, Uk. May 2006. Fierce! Festival, at Ikon Gallery, Birmingham, Uk. May 2006. Panorama festival, November 2005. Rio de Janeiro, Brazil. Festival Temps d’Images, Teatro da Politécnica (work in process), December 18th & 19th, 2015. Lisbon. Arquipélago Centro de Artes Contemporâneas. Artistic residency: February 29th – March 6th, 2016. Ribeira Grande, Azorean Islands. Espaço do Tempo. Artistic residency: March 7th-13th, 2016. Montemor-o-Novo. Espaço NEGÓCIO / ZDB, première. March 30th & 31st, Feb 1st & 2nd, 2016. Lisbon. Gentleness of a giant | Trip to a wrinkled plain. PAR & FIDCU, April-May. Montevideo. Festival Atos de Fala, Instituto Oi Futuro Ipanema, May 2016. Rio de Janeiro. Festival A Porta, June 2016. Leiria. Teatro Micalense & Public Art Festival Walk & Talk. June 4th, 2016. Ponta Delgada, Azorean Islands. Festival Artdanthé, Centre Wallonie-Bruxelles. Paris, France. March 2015. Centre Wallonie-Bruxelles (residency). Paris, France. February 2015. Festival Verão Azul. Lagos, Portugal. August 2013. Visiting card, LIFT/BAC. London, Uk. July 2012. Galpão das Artes do Espaço Tom Jobim | Rio de Janeiro Botanical Garden. Rio de Janeiro, Brazil. November 2014. FIDCU – Festival Internacional de Danza Contemporanea de Uruguay (presentations). Montevideo, Uy. May 2014. PAR – Artistas en residencia (residency). Montevideo, Uy. April-May 2014. Teatro Anchieta, São Paulo, May. April 2011. Panorama Festival, Rio de Janeiro, Brazil. November 2010. Diagnóstico Dança, Goiânia, Brazil. November 2010. Semana de Dança, João Pessoa, Brazil. November 2010. Instituto Itaú Cultural, São Paulo, Brazil. March 2010. Centre National de Danse d´Angers, Angers, France. December 2009. Centre National Chorégraphique de Tours, Tours, France. September 2009. Teatro Cacilda Becker, Rio de Janeiro, Brazil.August 2009. Premiered at: Teatro SESC Av. Paulista, São Paulo, Brazil. February, 2009. Festival Temps d´Images, Culturgest, Lisbon, Portugal. November 2009. Festival na Contramão, Teatro Escola SESC, Rio de Janeiro, Brazil. Agosto 2010. Panorama Festival, Rio de Janeiro, Brazil.November 2009. Premiered at: Teatro SESC Avenida Paulista, São Paulo, Brazil. March 2007. Espaço Cultural Sérgio Porto, Rio de Janeiro, Brazil. May 2009. Festival Internacional de Dança de Recife. Recife, Brazil. October 2008. Panorama Festival, Rio de Janeiro, Brazil. November 2008. In-Transit Festival, Haus der Kulturen der Welt, Berlin, Germany, June 2008. Bienal de Danza de Havana, Havana, Cuba, April 2008. Premiered at: Made in Brésil, Ferme du Buisson. May 2004. Paris, France. LIFT – Visiting card, Battersea Arts Center, London, UK. July 2012. Seminário Internacional de Composición Coreográfica, Mexico City, Mexico. December 2010. Teatro Camino, Festival Movimiento 6, March 2010. Santiago, Chile. In-Transit Festival, Haus der Kulturen der Welt, June. Berlin, Germany. Cocoa Datei Festival, November 2008. Buenos Aires, Argentina. Dialogos Neuquén, November 2008. Neuquén, Argentina. Festival Internacional de Dança de Araraquara, September 2007. Araraquara, Brazil. Performance and Human Rights (PSI and London Live Art Agency). June 2006. London, UK. Diálogos Dentro e Fora do Eixo, at SESC Ipiranga, July 2006. São Paulo, Brazil. Festival Internacional de Dança de Recife, in October 2006. Recife, Brazil. World Cultural Forum, Teatro Jóquei, November 2006. Rio de Janeiro, Brazil. SESC Theaters Tour (SESC Ramos, SESC São Gonçalo, SESC São João de Meriti), April 2006. Rio de Janeiro, Brazil. Centro Cultural Dragão do Mar, February 2006. Fortaleza, Brazil. Alkantara, August 2005. Lisbon, Portugal. Premiered at: Panorama Festival, in Rio de Janeiro, Brazil. November 2003. Later performed at:Mostra Artística of the World Cultural Forum, at Teatro SESC Pompéia, in São Paulo. July 2004; Festival Porto Alegre Em Cena, in Porto Alegre, Brazil. September 2004; 6th Caxias do Sul em Cena, in Caxias do Sul, Brazil. September 2004; Festival Internacional de Nova Dança, in Brasília, Brazil. February 2005; the Year of Brazil in France. Nov. and Dec. 2005. From 1995 until 2005, together with Frederico Paredes, they formed the company Dupla de Dança Ikswalsinats, where they developed a singular choreographic research allying humour to contemporary dance. Based in Rio de Janeiro, Ikswalsinats was supported by the Municipality of Rio de Janeiro through the Programa de Subvenção à Dança Carioca, from 2003 until 2005. For Mildred Mildred, the company was awarded a choreographic grant from the city´s cultural institute (RioArte). Mildred Mildred (2001) took part of Springdance / Preview, in April 2002, in Utrecht, Holland; under FILO – International Theatre Festival of Londrina, in May, and at the Festival Made in Brésil, at Ferme du Buisson, in Paris (May/2004), among others. Other pieces produced by the Dupla were Campos em Separado (1996), Cem Águas (1997), Não Pertence (1999), E nem mencione Esther Williams (2000), Também (2000), and the urban performances No meio do caminho (2002) and Dormimo-nos-emos aqui (2003). Artistic director of MANIFESTA!, at Teatro Cacilda Becker, September-December 2011, Rio de Janeiro. Sacred Festival, Chelsea Theatre, London. Guest curator of the Brazilian programme. Nov 2011 – July 2012. Terceira Margem do Rio, part of the Bienal de Dança de Fortaleza. 2010. Guest curator. Event Here whilst we walk & talk, co-curation with Andrea Sonnberger, Munich, 2006. Guest curator for Condança, in Porto Alegre, Brazil. 2005-2008. Largo das Artes. Rio de Janeiro, Brazil. May 2015. Hemispheric Institute for Performance and Politics – New York University. New York City, USA. April 2015. San Art Gallery. Artist talk. Saigon, Vietnam. January 2015. Tokyo Experimental Festival. Tokyo Wonder Site Shibuya. November 2013. Tapei Digital Art Center, Taipei, Taiwan. December 2012. Tokyo Fine Arts University, Tokyo, Japan. October 2012. V&A Museum, London, Uk. July 2012. Götemburg Dans & Teater Festival, Gothemburg, Sweden. May 2012. Fine Arts Academy, Ramalah, Palestine, October 2011. Coleção Roberto Pereira, at Manifesta!, Rio de Janeiro, September 2011. El Climamola, Barcelona, June 2011. Migraciones, at Museo Reina Sofia, Madrid, June 2011. Minha história da dança, at Rumo do Fumo & Fórum Dança, Lisbon, Portugal, February 2011. Espaces de La Danse, at Opéra de Lyon/Maison de La Danse/Université Lyon 1, Lyon, France. November 2009. Seminario de Dança e Pensamento, Fortaleza, Brazil. January 2009. Festival Danza en tránsito – Teatro Solis, Montevideo, Uruguay. December 2008. Vecinos, at La Casa Encendida, Madrid, Spain. October, 2008. Here whilst we walk and Vecinos, at Aula de danza – Universidad Alcallá de Henares, Spain. October 2008. Ikus Mira, at the Basque University, Bilbao, Spain. June 2008. Here whilst we talk, at Der Farberei, Munich, Germany. September 2006. Panorama da Dança – Round table Rights on scene – contemporary dance and human rights, November 2006. Conversas Alkantara, at Fnac Chiado, in Lisbon, June 2006. O Corpo Representado (The represented body) at Itaú Cultural Institute, in São Paulo, Brazil. March 2005.
International Dance Encounter, at British Council (Rio) and at Itau Cultural Institute (São Paulo). May 2005. Chá com Isadora/ Tea with Isadora, at Espaço SESC Copacabana, Rio de Janeiro, Brazil. 2003. Dança é para se ouvir, at Festival Dança Brasil, at CCBB, Rio de janeiro, Brazil. 2003. Springdance Dialogue, in Utrecht, Holland. 2002. I Encontro de Dança da Universidade Federal do Rio de Janeiro – UFRJ. 2001. PAR – Programa Artistas en Residencia & FidCU, Montevido, Uruguay. April-May 2014. The Slaughter House, Egilstadir, Iceland. January 2014. Cidade da Artes & Panorama Festival, Rio, Brazil. October 2013. Kokko 1721, Kangasniemi, Finland. August 2013. OI Futuro for the creation of Those who walk on the ground, who climb trees, who bear wings, Rio (2014). FADA (Fundo de Apoio à Dança) for the creation of A room of wonder | Rio (2013). International Creator in Residency, Tokyo Wonder Site, Tokyo (2012). International Emerging Artist in Residency, Bamboo Curtain Studio, Taipei(2010). Klauss Vianna Prize for the creation of Nothing.We shall see. APCA Awards 2008 (São Paulo Art Critic Association) for best dance conception in dance Still – sob o estado das coisas. Klauss Vianna Prize 2006 for the creation of Still – sob o estado das coisas. DanceWEB, Impulstanz, Viena, Austria. July 2011. Rumos Dança Itaú Cultural, 2009/2010, Brazil. Research scholarship to prepare the piece They shall see. Klauss Vianna Prize 2008, Brazil. Research scholarship to prepare Nothing. We shall see. Centre International d’Exchanges Les Récollets, Paris, France. July-September 2008. Bolsa RioArte (with Frederico Paredes), Rio de Janeiro, Brazil. 2000-2001. Research scholarship to prepare the piece Mildred Mildred.